The girls have started school this week, and I am still trying to adjust to our new schedule. My oldest daughter is now in 4th grade, and my younger one started kindergarten. 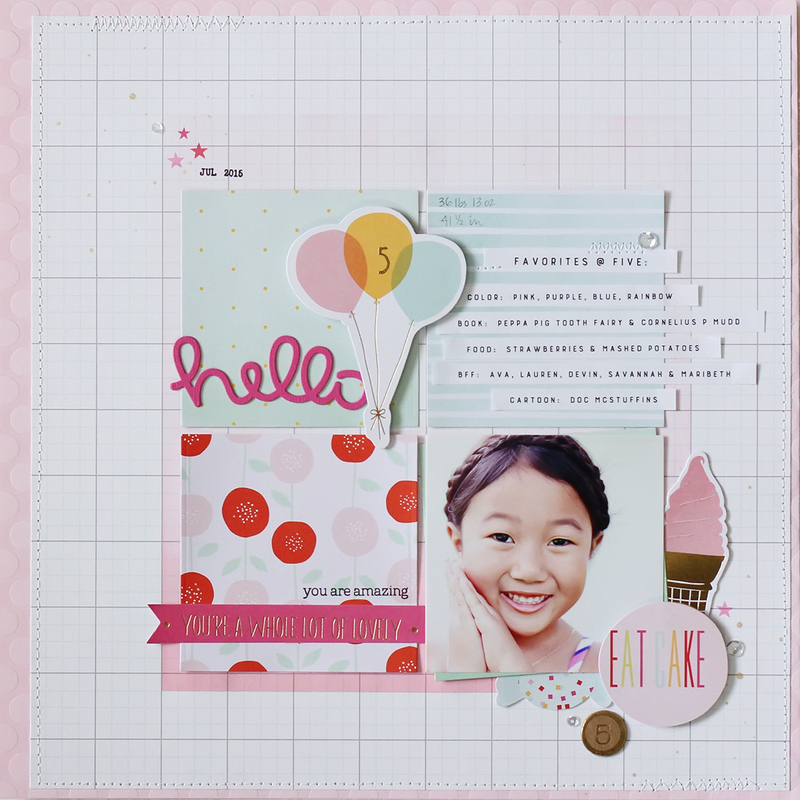 (Scrapbook layouts to come soon!) While they were at school yesterday, I finally found some time to craft! I recently won a giveaway, and I got a stamp set in the mail. 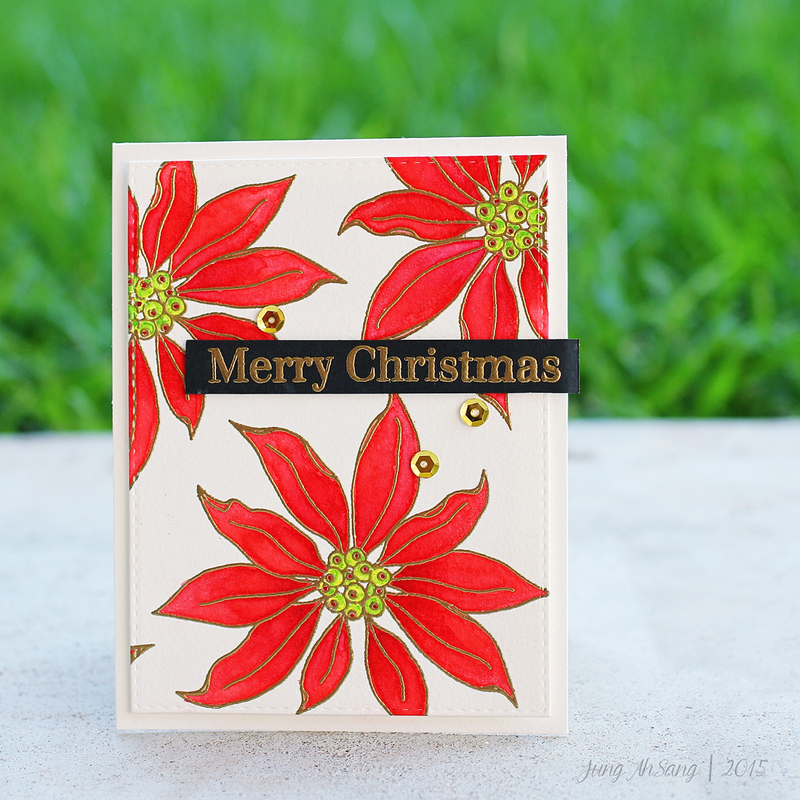 It’s the Mondo Poinsettia by Julie set by Essentials by Ellen. I really like to get the most use out of my stamps, and I didn’t want to use this stamp set only during holidays, so I had the idea of making a fall card using just the leaves. I love the way it turned out! 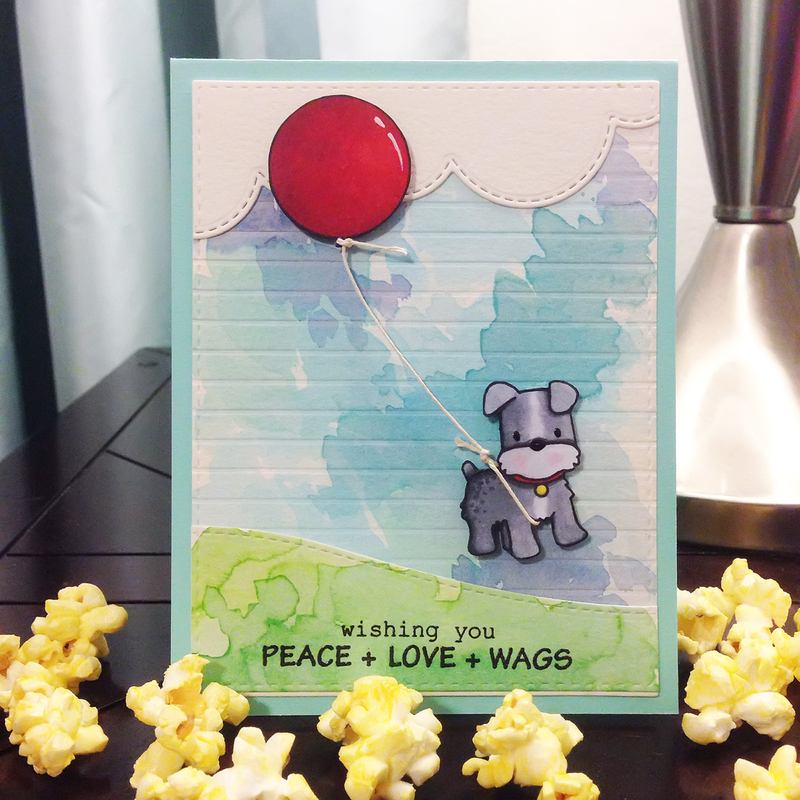 Pictures, supplies, and the steps I used to create my card are all included in this post! …and since I had my supplies out anyway, I made a holiday card as well. I stamped the images several times in Versamark ink on watercolor paper, and embossed using American Crafts Zing gold embossing powder. Then I watercolored the images using my Kuretake Gansai Tambi watercolor palette. Once dry, I die cut a big square out of the leaves image, and a rectangle out of the poinsettia image. I attached the watercolored images using foam tape to card bases that I made. I stamped the sentiment from the Stephanie Bernard for Sizzix stamp set using the same ink and embossing powder onto black card stock. Using my paper trimmer, I trimmed the sentiment, and attached it to my card using some thin foam tape. Lastly, I attached a few gold sequins using glossy accents (my favorite wet adhesive), and added a little extra shimmer using my wink of stella glitter pen,. Hope you like my cards! 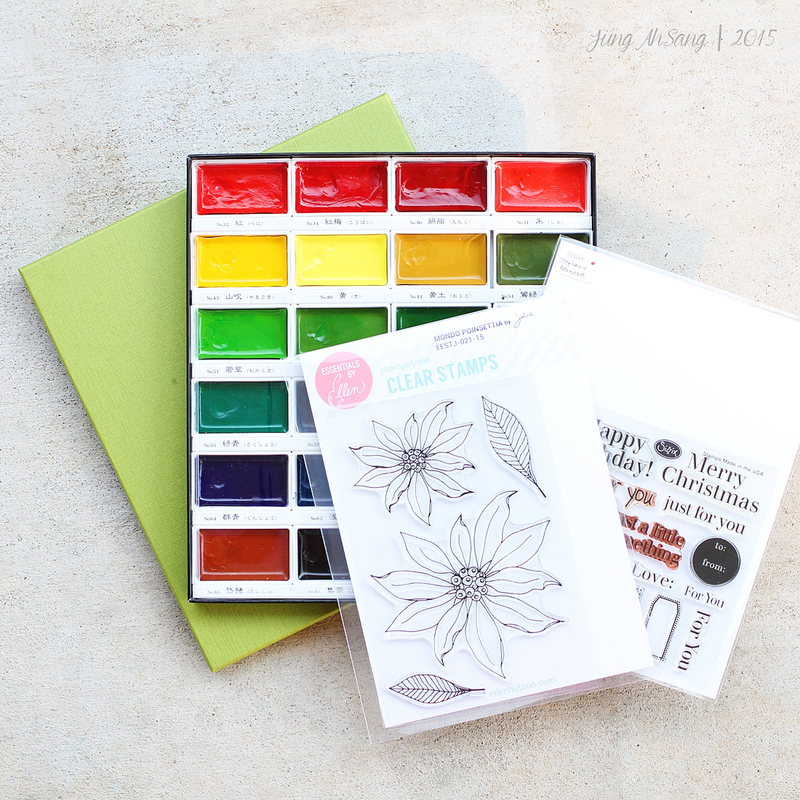 Even though this stamp set is geared more towards the holidays, you could easily use it year long by stamping and coloring the leaves according to the season. I’m here today, showing what I created for Kathy’s Pop Up Challenge at thedailymarker.com. You can read all about it here. 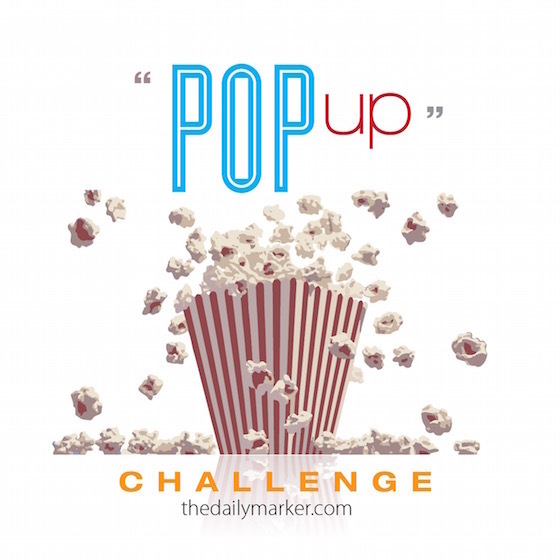 The pop up challenge is over now, but she will be hosting her 3rd 30 day coloring challenge Oct 1 – Oct 30. You can read more about the 30 day coloring challenge here. As I’ve said before, I absolutely LOVE challenges! They motivate and inspire me…even better when there’s a theme! The theme of the 4 day pop up challenge was lines. 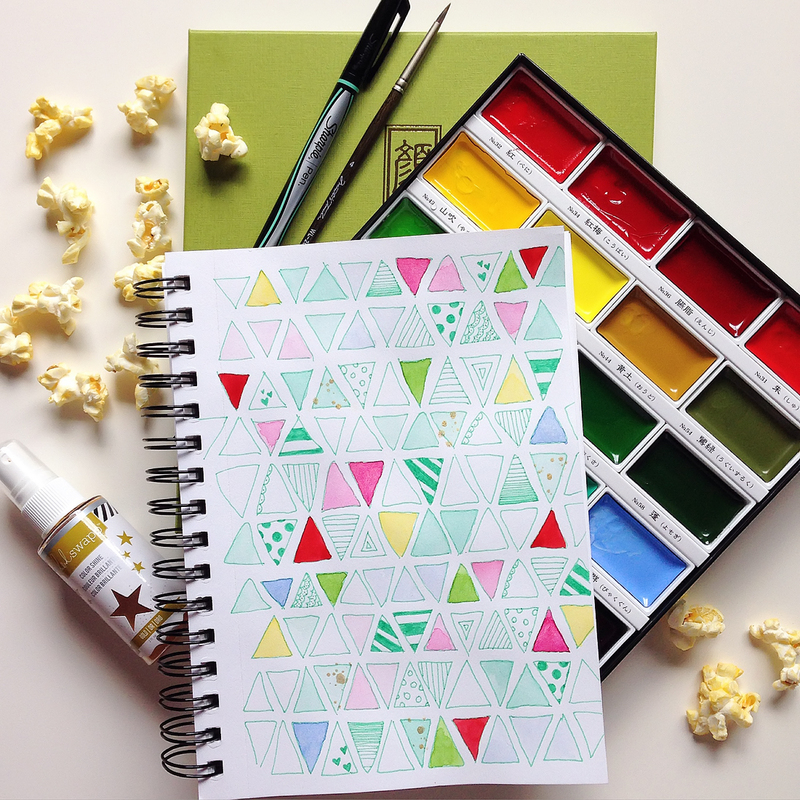 For this challenge, I was inspired by patterned paper and background stamps, so I doodled some triangles, and colored with water colors. I created this card for my niece’s first birthday. 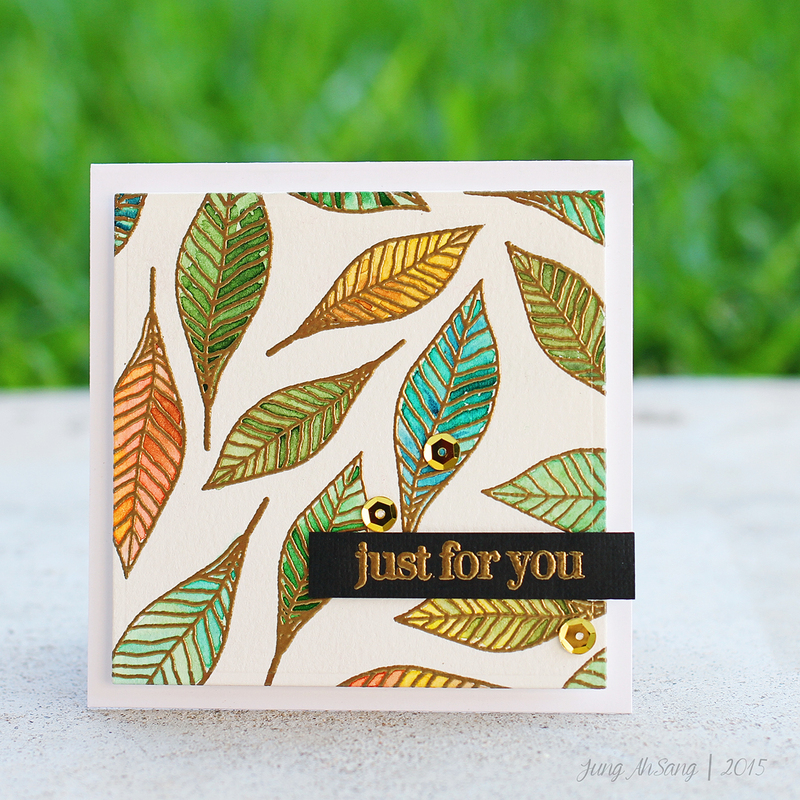 I was inspired by the lines Kathy created using stitched embossing dies. Since I don’t have any, I thought of running my card stock through the sewing machine with no thread. It worked out great! I didn’t have too much time on Day 3. 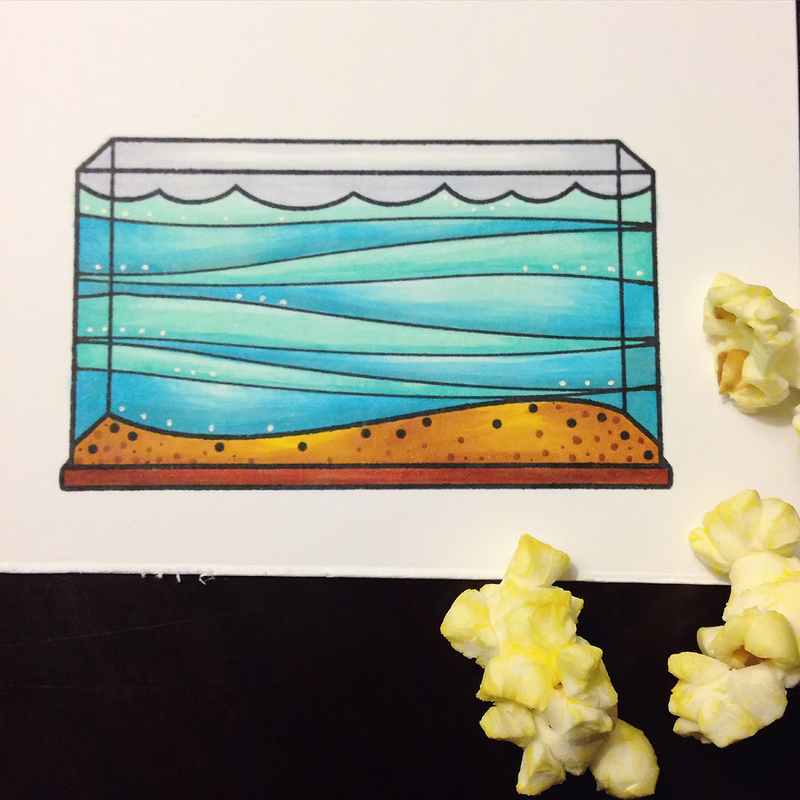 In fact, I started coloring this fish tank 1/2 an hour before midnight! I was inspired by all the other participants’ blue watery, oceany waves, so I created mine in this fish tank. For this card, I wanted to try creating lines in a different way than my previous days. I created the background stripes by scoring a piece of water color paper with my score board. 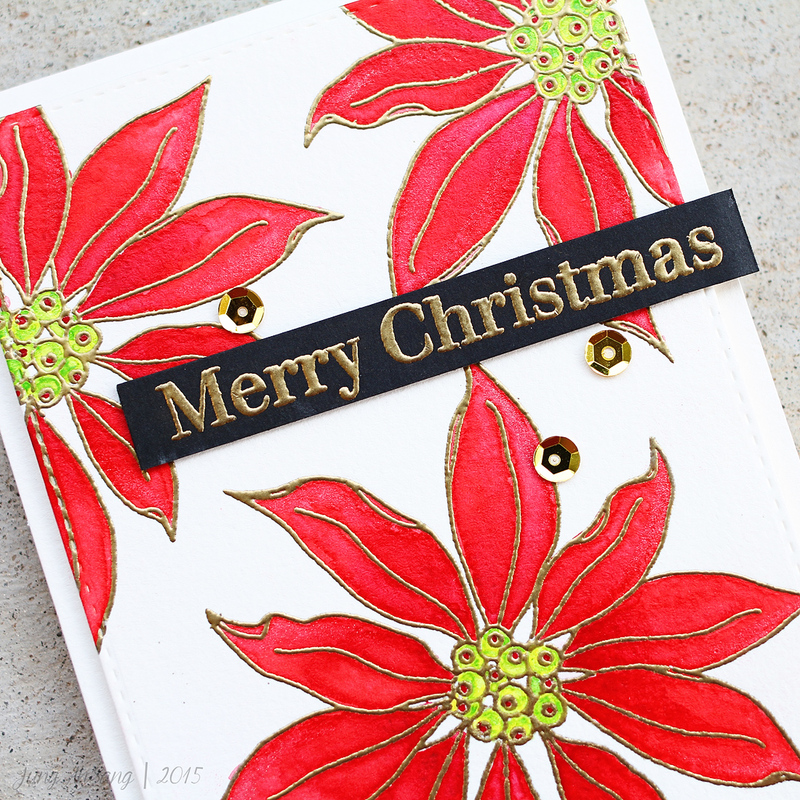 (It created the look of an embossing folder!) Then, I water colored right on top, and love how it turned out! Without this challenge, I might not have thought to try this “technique,” but I will for sure be using it again in the future! Tim Holtz distress ink in colors: tumbled glass, chipped sapphire, salty ocean, evergreen bough, mowed lawn, & pine needles. That’s it! I absolutely loved this pop up challenge! I love that it had a theme, since it forced me to be more creative to change it up each day. I also was able to participate all 4 days. My second daughter turned 5 at the beginning of July, and I am just now getting around to scrapbooking her 5 year old and birthday party layouts. She changed her mind a million times on what theme she wanted for her birthday, but finally decided on Doc McStuffins (a Disney Jr cartoon). I made her a birthday card and party favors featuring her favorite character on the show: lambie. I used Lawn Fawn flirty frames stamp set for the swirly circle frame for both the card and party bag. 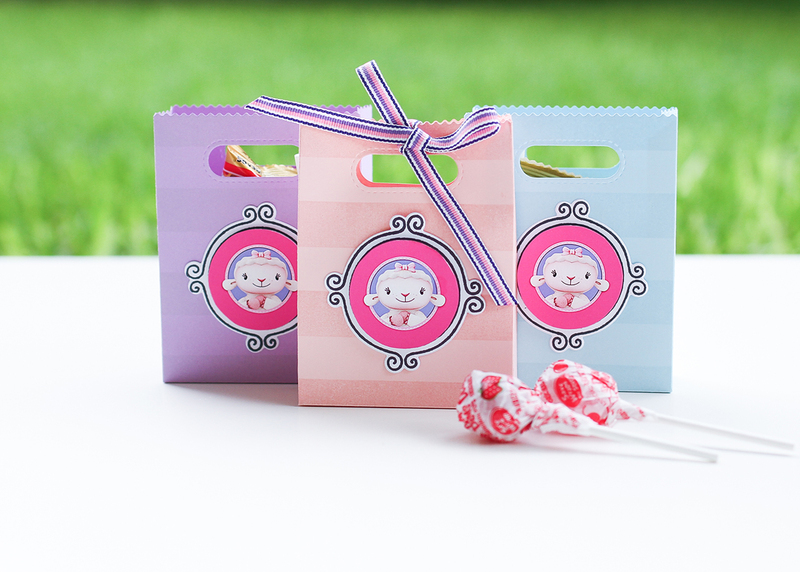 I used the Lawn Fawn goodie bag die for the party bag. I also used Simon Says Stamp 6×6 tiny spaced hearts stencil on the card, and Simon Says Stamp 6×6 wide stripes stamp on the party bags. Since we were having an outdoor party, we stuffed the bags with candy that wouldn’t melt, like gummy bears and lollipops. For this layout I used a lot of American Crafts Dear Lizzy product. I always love anything from the Dear Lizzy lines! Her Fine and Dandy collection has a bit of a birthday theme to it, so it’s perfect! I used the 6×6 paper pad and a pack of the die cut card stock shapes. Here’s her birthday party double page layout. (I blurred some faces and names for privacy.) There are a lot of #5s in this layout. How many can you spot, lol! For birthday parties and events where I have a lot of photos, this is my go-to layout. The double page grid easily allows me to incorporate a ton of photos, and I can still pretty it up with patterned paper, stickers, stamps, etc. I used to punch out the squares with a giant square punch, but now I have nested square dies, so I can die cut the squares, and even square frames…I absolutely love my sizzix die cut machine! Again, I used a lot of Dear Lizzy Fine and Dandy product. I also incorporated a few stamp sets. I try to get as much use out of my stamp sets as possible. I used Mama Elephant Charmed, Lawn Fawn Fintastic Friends, and Avery Elle Numbered Balloons. Let me know if you have any specific questions, and I’ll gladly answer if I can! p.s. there are 7 number 5s in the party layout, not including the 5 in the dates! Rainbow fish card featured on Simon Says Stamp blog! 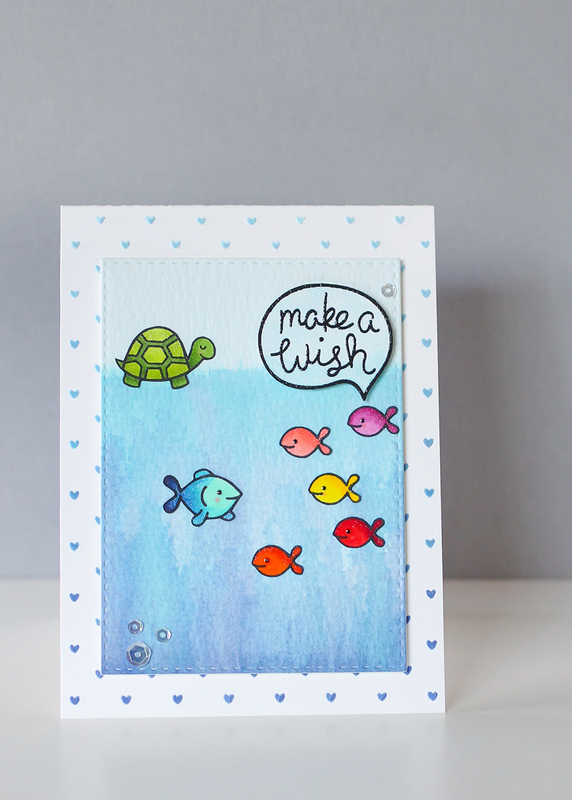 Today, I’m sharing a card that I created for the Simon Says Stamp blog! What?!!! 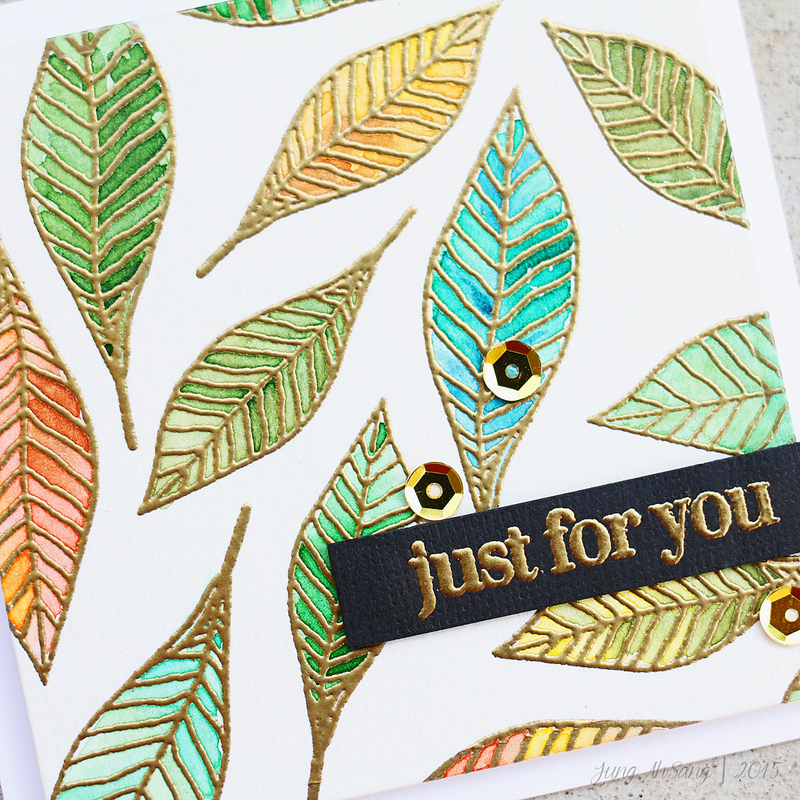 That’s right, my card is featured on the Simon Says Stamp blog, and you can find it here to see a few more pictures, read about my inspiration for the card, and find a complete supply list. I used a lot of Lawn Fawn, and Simon Says Stamp product for this card. I also mixed a bit of watercoloring with distress inks and copic coloring as well. I am just so honored and thrilled to be featured on the Simon Says Stamp blog! 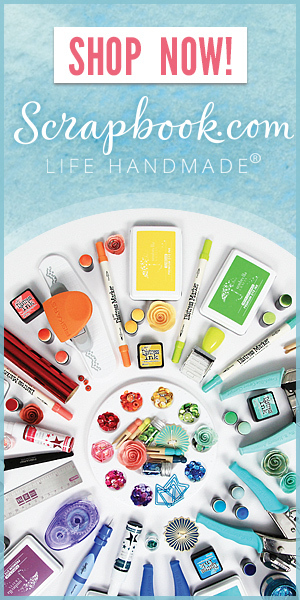 I love their brand products, and you can find everything you need all in one place! 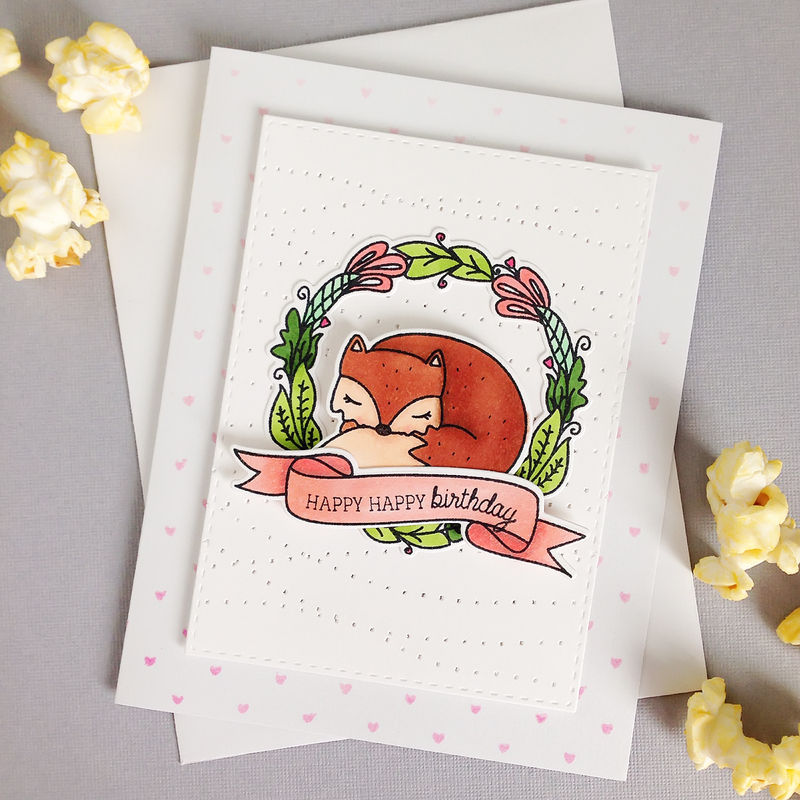 Thanks for dropping by, and check out my card on the Simon Says Stamp blog! Today I’m sharing with you two cards. The first card is a card that I made for Mama Elephant’s “stamp with me” flickr challenge. The theme for August is water coloring. Here is the mama elephant blog post. My second card is one that I made for Simon Says Stamp’s flickr challenge. The theme is favorite technique. I love shaker cards, and I have begun to love water coloring! Here is the flickr discussion. I love playing along in challenges! They inspire and motivate me! What about you? I just purchased a Kuretake Gansai Tambi watercolor set. Can I just say that I’ve never used watercolors that are so incredibly buttery and pigmented?! Love them!!! I have slowly begun to love watercoloring after lots of practice, especially after my water color card blog post. I also recently purchased Mama Elephant’s charmed clear stamp set and matching dies. I am hoping to get a lot of mileage out of this stamp set. I do newborn photography, and I like to include handmade cards along with my clients’ orders. This stamp set is perfect for that! I will also use the wreath for holiday cards as well. Win win! The supplies I used will be posted at the bottom of this post. 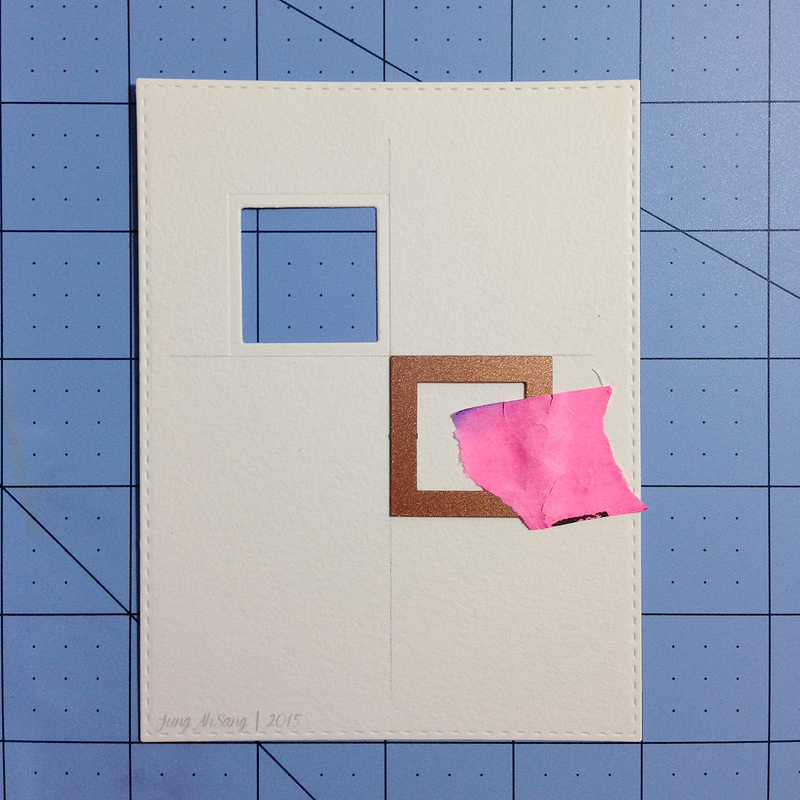 To create the window frame, I first cut out a piece of water color paper with a rectangle die. Then I marked two lines to use as a guide for where I wanted to die cut a window using a small square die four times. 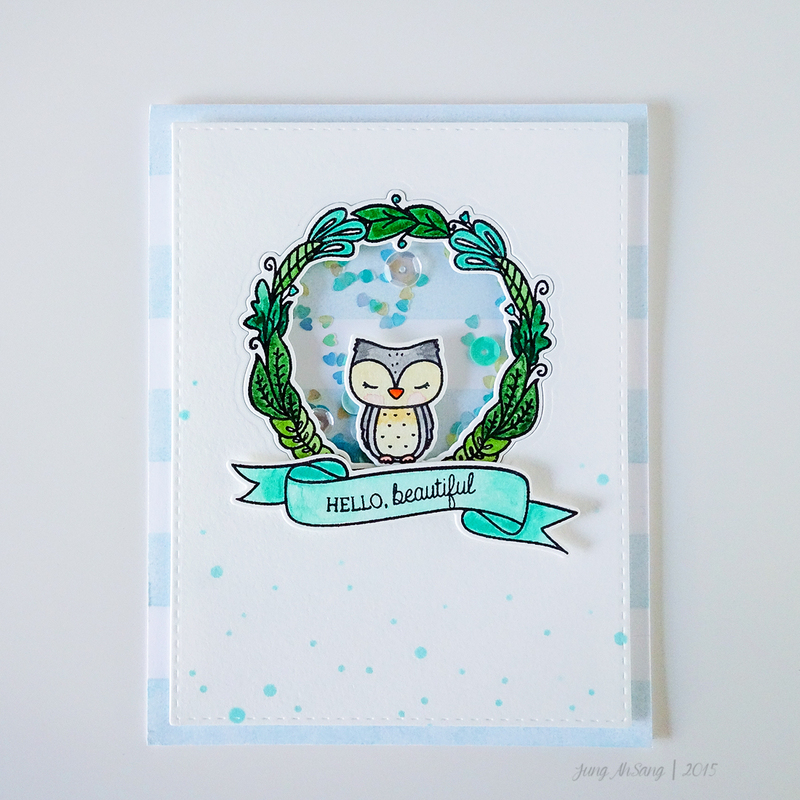 For the background, I used distress inks to create a soft sky. I used foam tape to pop up the window panel to give my card dimension. By leaving off the “girl” in the “HELLO, beautiful GIRL” sentiment, I was able to create a perfect sentiment for a boy card. For this card, I wanted to make something a little different. I used a stencil and a striped background stamp. Then I decided to make this card a shaker…I do love shaker cards! …and that’s it! Thanks for stopping by!